A 2009 Government Accounting Office report revealed that two-thirds of the one hundred largest U.S. publicly traded corporations and largest contractors for the U.S. federal government had subsidiaries in countries generally considered tax havens. According to some estimates, fully half of the world’s wealth is held in offshore accounts, where it is largely beyond the scrutiny or control of governments or laws. 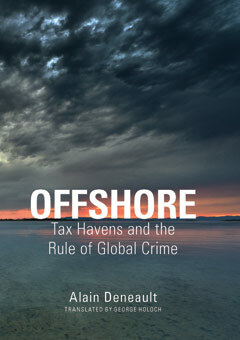 Offshore reveals how a vast network of unregulated financial centers—from Luxembourg to the Cayman islands to the tiny Pacific haven of Nauru—has evolved into an enormous nether realm of drug and arms trading ungoverned by national laws. Delving into the scandals, the financial structure, and the history of this hidden side of globalization, sociologist Alain Deneault depicts something larger and more ominous than simple “tax havens” where financial elites and corporations must reside to protect their earnings. Instead, Offshore describes a global base of operations from which massive criminal enterprises and corrupt corporations operate freely and with impunity, menacing developing nations and advanced democracies alike. Published at a time when the world is fed up with financial shenanigans, Offshore is a fascinating and timely new book that presents a startling revisionist account of how the global economy actually functions today.